There was a strong belief that the wings caused psychological effect on the enemy, frightening horses and riders. Surprisingly it's mentioned mainly by foreign, not Polish sources, what now leads historians to think that it was just a rumor. Husaria used horses that were breed and trained specially to this aim. They were a mixture of Polish and Tatar blood horses, able to run very fast even under a heavy load. They were also recovering quickly. Thanks to these, and to a special kind of saddle, hussars and the horse could wear much heavier armor. They could also repeat the charge several times during the battle. The tactic of husaria included a special kind of charge, which proved to be decisive in many battles won by Polish-Lithuanian Commonwealth. By concentrating the formation at the last, crucial moment before crushing the enemy, it was able to completely break the enemy lines, while still being able to change formation or direction even a short time before crushing the opponent. By combining speed and mobility with advantages of strong formations, it was effective against both eastern and western armed forces. Apart from Vienna, other famous battles were Kircholm (1605 against Sweden) and Klushino (1610 against Russia). As I've written, the charge could be repeated during the battle, going on and through the enemy line, until the enemy forces were finally broken. The main weapon was a lance, which varied in length depending on the enemy. Hussars also had a stabbing sword (koncerz), a sabre (szabla), pistol (or two), and often a carbine or arquebus (bandolet), and even a bow. I've got a tendency of depicting this battle with colorful details, legends and anecdotes which are sometimes more or less fake (as it's typical to tourist guides), but I'll try to stick to the facts. 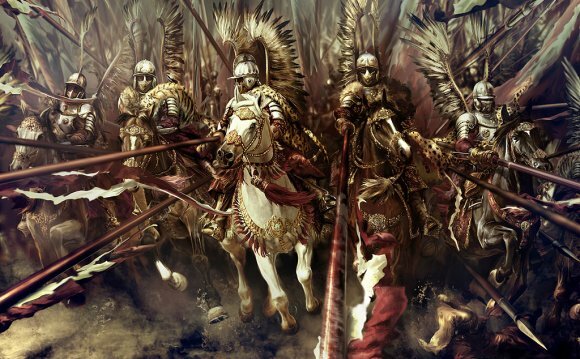 The charge of winged hussars started at 6 pm, while the battle started in the morning. Different historians counts the overall number of cavalry that took part in it as more or less 20000 of horses, what makes the charge of John III Sobieski the biggest cavalry charge in history. This way the mentioned 3000 were only the heaviest, frontal part of the charge, which was supported by other Polish, Austrian and Bavarian cavalry forces under the command of Polish king. As for Polish cavalry that was stopped in difficult terrain, mentioned by Drux, it's surely connected with the charge of Zwierzchowski and his 200 hussars, that were sent by Sobieski to probe enemy lines and check for possible traps. During the charge it was stopped by the ditch or trench, before it could continue and return to the king with heavy losses. Thanks to them main forces avoided the obstacle.